The spectacular Gold Bar Rim Singletrack (formerly "blue dot"), part of the Mag 7 trail system. The Mag 7 trail system is located just west of Moab. Highlights include Bull Run, Arth's Corner and Gold Bar Rim. The trails in this area total 52 miles, though the true "Magnificent 7" link-up from Gemini Bridges Road to the bottom of Portal is 22. For Moab, this might qualify as a three-star ride... if you exclude Portal and Gold Bar Rim Singletrack, that is! Coming from anywhere else, though, this one is for advanced intermediates or expert riders. If you're not an expert, you'll want to heed the signs that suggest turning around at the north end of Little Canyon. This varies dramatically -- anywhere from 2-6 hours is appropriate depending on your choice of route. The Magnificent 7 trail system -- more commonly, "Mag 7" -- sits just west of Moab proper and Arches National Park, in the Gemini Bridges Road area. The most commonly-used trailhead, at the top of Bull Run, is a short drive from highway 313 on the way to Canyonlands National Park and Dead Horse Point State Park. There are over 50 miles of trails here, not counting any of the 4x4 roads, nor the 20 miles of trail in the adjacent Horsethief system which opened in 2015. Originally, Mag 7 was named for the 7 trails it linked together: Bull Run, Arth's Corner, Little Canyon, Gold Bar, Gold Bar Rim and Portal. Wait, that's only six. Were they counting Gemini Bridges Road? What about Great Escape and Getaway? If Portal counts, Poison Spider should count too, right? And, now that Moab Trail Mix has added 7-up to the area... well, it's more than 7. Let's just leave it at that. It used to be that many of the mountain biking "trails" in Moab were ledgy, rugged off-road doubletrack routes shared with 4x4 vehicles, but those days are gone. The Mag 7 system, completed in 2011, is the result of a concerted effort to build separate trails for different user groups, and especially an effort to build singletrack trails for mountain biking. The Magnificent 7 / Gemini Bridges area is dominated by varied, fast, ledgy singletrack with expansive views and some excellent slickrock riding. The lines use the terrain well and, beyond some rock-stacking here and there, are entirely natural. 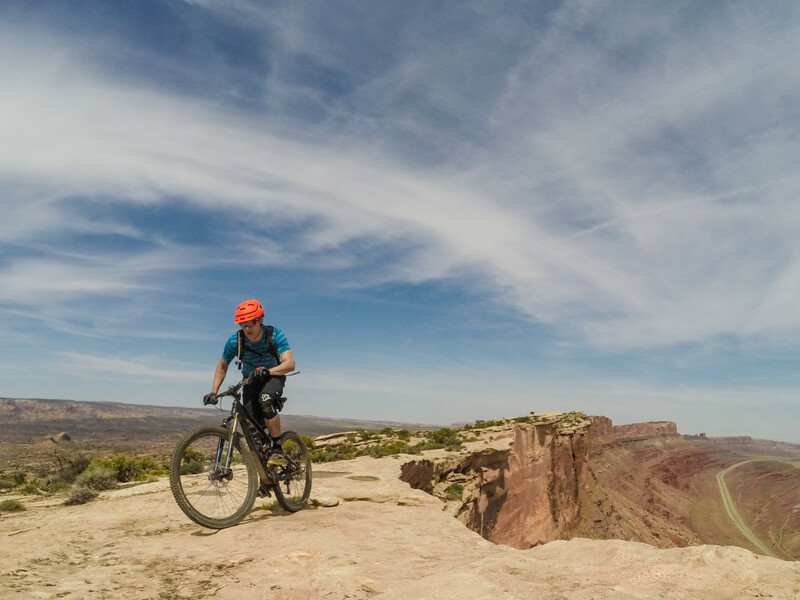 Intermediate riders will want to stick to the southern end of the system; we suggest looping Bull Run, Arth's, Little Canyon, Getaway and Great Escape into a fantastic 20-mile ride. Expert riders with solid endurance and a taste for exposure can tackle the full Mag 7 linkup. This includes a fairly grim slog out on Gold Bar 4x4 to experience the unbelievable Gold Bar Rim singletrack, the legal trail which opened in 2015 to replace the illegal classic "blue dot" route. The finale is the epic return to 279 via Portal. We'd recommend a shuttle for this one, a service most of the local bike shops offer. Please note: Portal includes deadly exposure along several short sections, and signs along the trail warn riders to dismount and walk. Heed them! There are no fees to park and ride here, but some rides are best attempted with the benefit of a shuttle up to the trailhead on highway 313. There are also several good loop options from the trailhead parking at the start of Bull Run. While this trail system certainly can be ridden in summer, we'd recommend against doing anything ambitious unless you're wheels-down at sunrise. 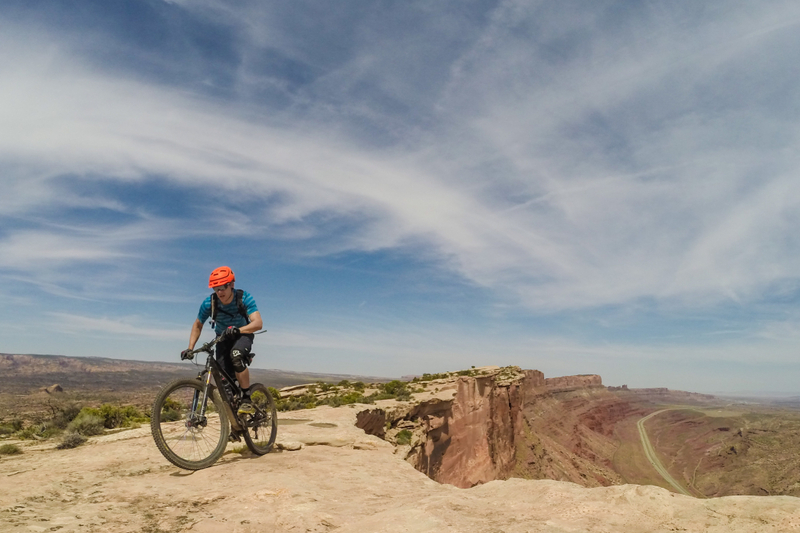 Moab temperatures routinely eclipse 100 degrees fahrenheit in July and August, and with zero shade and zero access to water it can be a dangerous gamble to attempt a big ride!